Set Includes Pre-1970 Mexican Diez Centavo Coin! Reverse side of the card highlights historical information about Chief Ouray and his desires as leader of the seven Ute tribes to negotiate peace with the whiteman during the late 1800s. Sure to please the stamp collector and history buff! Collectible stamp/coin combination sets are packaged in resealable plastic protectors. 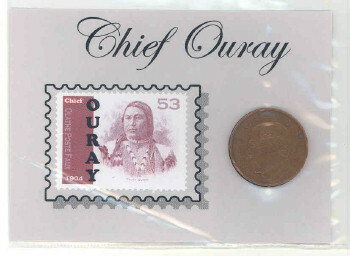 Stamp collectors please note: Because of it's beauty and unique image (1904 engraving) of Chief Ouray, this stamp was selected for use by the United States Bureau of Printing & Engraving Managers Group for use on their own limited edition, Chief Ouray commemorative print published in 2004. STAMP DESIGN, PRINTING and PERFORATING by THE OLATHE POSTE.